Fajitas can be prepared in a huge number of varieties and styles. The presentation factor can be incredible with the aromas during preparation and the wildly sizzling pan as the dish is being served to the table. Remember these things and try to plan the timing just right to accomplish our goal of preparing “The Perfect Fajitas”. As a note, the dish calls for filet mignon, an expensive cut of meat. You may think “why” use such a quality choice in beef when we could use something less costly…especially when the meat will be wrapped up inside of the shell and surrounded by a myriad of great flavors. First, note that it will be accompanied by chicken and other filling ingredients, so the size of the filet only need be about a half to three quarters of a pound, which will minimize the cost. Second, the choice of filet will become truly apparent as you prepare (and eat!) the final product. The innate tenderness will create the sensation of the meat melting in your mouth. The flavor is spectacular, and the presentation of the lean, seared, pink-centered beef is very attractive. One other note for preparation… The goal here is to not immerse our core ingredients with too many seasonings or sauce. The juices produced by the meats and vegetables will come together to create a wonderful flavor. Just a touch of Teriyaki is used to bring out the nature flavors and provide a bit of saltiness. Cut the tomatoes in quarters the long way (wash out the seeds if you wish) and cut these into small, evenly sized slices. Shred about two handfuls of lettuce. Finely shred the cheese. Add the sour cream into a small serving bowl and place in the middle an over-sized round plate or platter. Evenly space the lettuce, tomatoes, and cheese evenly on the plate around the bowl. Set aside in the refrigerator until serving. Trim the filet. Add a good amount of fresh ground pepper to both sides. Cut the chicken into 2-3 inch thin strips. Brush until covered by a very light layer of the Teriyaki Sauce and season with fresh ground pepper and Italian seasonings. The Italian seasonings add great color, fragrance, and flavor to the mild flavor of chicken. Wash and cut the mushrooms into thick slices. Cut the onion in quarters and then slice each quarter just one or two more times. Add a bit of olive oil to your pan and bring up to HIGH heat. Sear the filet for a full minute on both sizes. If the filet is nice and thick, also sear the sides. Remove the filet and set it aside to rest. Searing the surface of the meat quickly on high-heat locks in the nature juices and also adds to the presentation. Note that the filet will be very rare in the center at this point. With a bit more olive oil, add the chicken to the hot pan. Stirring constantly, cook for about 3 minutes, being mindful not to overcook. The key here is that the chicken should be just barely cooked through or even slightly undercooked in the center. Remember, food continues to cook after you remove it from the heat. And, we will be returning the chicken to a very hot pan immediately before serving. Remove the chicken from the pan into a clean dish and cover. Add another splash of olive oil and the mushrooms to the pan. Continue to cook on high-heat, stirring constantly, 3-5 minutes, until the moisture of the mushrooms begins to come out. The total volume should reduce by about half, and the mushrooms will have a squeaky sound as they are stirred. Mix in small amount of teriyaki sauce and immediately remove from the pan to clean dish. Add the onion to the hot pan with a bit more olive oil. Cook on high-heat about 3 minutes until lightly charred. The onion should still have a slight crunch, so be careful not to overcook. Stir in the remainder of the teriyaki sauce and immediately remove from the pan. Clear the pan out a bit at this point by adding a small amount of water. Be careful when you do this…the water will sizzle up and may splatter! 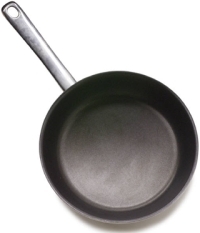 After quickly rinsing, return the pan to high-heat. When the pan is nice and hot, add one fajita shell. With a wooden spoon, constantly slide the shell around the pan, so it does not burn through. After 15-30 seconds, flip the shell and brown the back. When lightly browned, remove from pan to a covered plate. Brown all of the shells in this manner. Take our filet and cut it into thin slices. The slices should end up being oval-shaped, about 1.5 x 3 inches, so that each is seared around the edge and red in the center. Now, bring the plate of cold ingredients out from the refrigerator and take to the table. Make a place at the table and place a hot pad to be ready for our sizzling pan. Meanwhile, let the pan get nice and hot. Add the filet and briskly stir for about 10 seconds. Push the filet into one corner of the pan. Add the chicken, stir for 10 seconds, and again push it into one quarter of the space. Add the mushrooms, and push into the third quarter. Then, add the onion into the remaining space. The ingredients are now separated, so the consumer may make their own choice of what to add and how much to use of each. Immediately serve the sizzling pan to the table. This sounds really good, I love that you use filet mignon instead of flank steak. I bet that’s awesome.